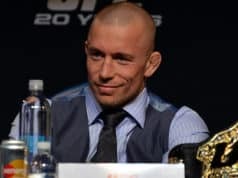 Former UFC welterweight champion Georges St-Pierre shared a bitter feud with Nick Diaz in the lead up to their fight in 2013. A lot has changed since that time though, ‘Rush’ has exited the sport and vacated his title, and ex-opponent Diaz has been sent to the sin bin for the next five years. Two of the sport’s biggest draws gone for the foreseeable future, and that stings a little. 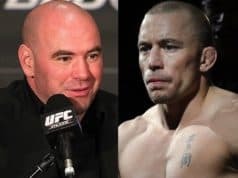 “Personally, I think five years is a lot, especially if you compare his case to Anderson Silva or other athletes who got caught cheating and received a lighter suspension. I think they wanted to use him as an example because of how colorful he is and of the attention he gets. They wanted to create a precedent similar to what has been done in Olympic sports with Marion Jones, for example. “Nick is a very charismatic, he makes a lot of attention, but it’s not someone I hate. 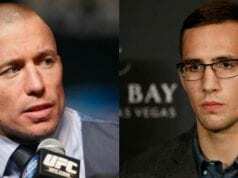 I have no hatred toward him,” St-Pierre said. “Many things had been said before our fight, but it was only in sporting terms. I did not take anything personal. 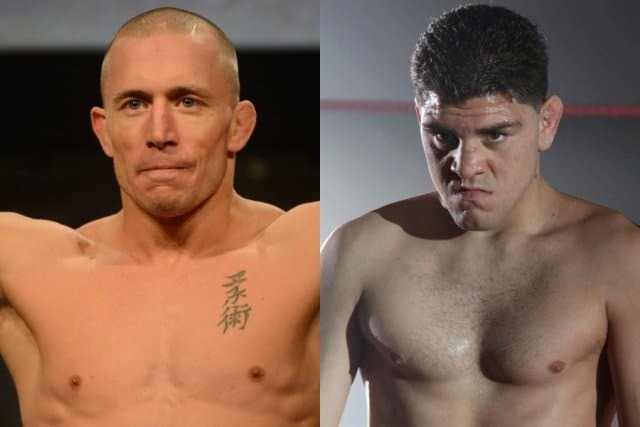 It what bizarro world does Georges St-Pierre back up Nick Diaz’s plight? Who knows what’ll happen next, but Diaz’s fighting future is essentially out of his hands for the moment.